Wheat pennies have been a popular coin to “snag” out of circulation ever since the Memorial design on the reverse of the Lincoln penny replaced the two wheat stalks in 1959. While wheat pennies are getting increasingly hard to find with each passing year, they are still located in pocket change occasionally, and many people have wheat pennies by the hundreds — and even thousands — in penny rolls, food jars, clothes drawers, attic boxes, and coin collections. In general, most wheat pennies are worth only a few cents (perhaps 10 cents) if worn and of a highly common date and mint mark combination. However, many are quite valuable. In fact, some of the scarcest wheat cents are downright expensive — costing into the hundreds of dollars in the most worn condition. Wheat pennies replaced the Indian Head design, which adorned our nation’s one-cent coin from 1859 to 1909. In 1909, Victor David Brenner’s famous profile of President Abraham Lincoln was chosen to grace our nation’s one cent coin, coinciding with the centennial of Lincoln’s birth. On the back side (reverse) of the coin, two wheat stalks were placed around the words “One Cent.” This design would go on to enjoy 50 years of production by the U.S. Mint. Over these years, several scarce date and mint mark combinations were produced in a coin series which survived two world wars, The Great Depression, and monumental societal changes. *Values according to the Professional Coin Grading Service’s Lincoln cent value guide. 1922 no mint mark — Only the Denver mint produced pennies in 1922, but weak dies (the device itself which actually imprints the image into a coin) produced coins with a faint “D” and some coins on which no “D” mint mark appears at all. 1955 doubled die — This coin bears a distinct, doubled image on its front side (the obverse). This image doubling was not intended by the mint and, thus, is considered an error. 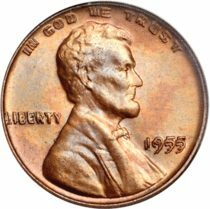 However, the 1955 doubled die penny is an error coin which has a very strong following, and some diehard penny collectors consider the 1955 doubled die penny as essential to have for a complete Lincoln cent collection. Though not rare, perhaps one of the most interesting date collectors and non-collectors alike clamor for is the 1943 steel penny. The U.S. Mint used a steel composition in 1943 to ration copper for the war effort. Today, 1943 steel pennies in circulated (worn) condition are generally worth less than a dollar. For the sesquicentennial of Lincoln’s birth, Frank Gasparro designed the Lincoln Memorial reverse with which Americans have been familiar since 1959. By the way, the last Memorial cent will be struck in 2008. To find out more about Lincoln cents, read “A Guide Book of Lincoln Cents,” a Whitman publication by Q. David Bowers.